Chapter 10 of Crucible of Pueblos, by Richard Wilshusen and Elizabeth Perry, looks at the position and roles of women in early Pueblo society, with a particular focus on how those roles seem to have changed with the economic and demographic changes of the late Basketmaker III and early Pueblo I periods that recent research is bringing into focus. It’s a thought-provoking chapter but in some ways rather odd, with many of its most intriguing proposals resting on what seems like fairly thin evidence. The chapter looks at three main topics: food production, human reproduction, and gender relations in social power. Its overall thesis is that in the northern Southwest between AD 650 and 850 interrelated changes in food production systems and human reproductive rates led to major changes in gender roles, particularly regarding the division of labor between men and women, that may have led to settlement aggregation into villages and to changes in social power related to trade and ritual. The resulting social structure, in place by the end of the Pueblo I period in at least some areas, was the earliest form of the “Pueblo” society as known from modern ethnography, with its strict division of labor by gender and extension of this gendered ideology to many other domains of life. Of the three main topics, the authors devote the most attention to the first, and it’s here that their arguments are strongest and most clearly supported by the archaeological evidence. The key change in food production during the period in question is the intensification (not introduction) of maize agriculture as the primary subsistence activity, supplemented by the growing of other crops like beans and squash, by the raising of domesticated turkeys, and by hunting and gathering of wild foods. Recent research has clarified the sequence and extent of this change, although a lot of questions still remain. As the authors note, one of the most puzzling results of research on early agriculture in the northern Southwest is that maize is now clearly established as having been introduced as early as 2000 BC in several widely spaced parts of the Colorado Plateau (including Chaco Canyon), but for hundreds of years it appears to have remained a minor part of the diet of the groups that used it. It was only in the Basketmaker II period, between 300 BC and AD 300, that maize use became widespread, and even then, according to Wilshusen and Perry, local groups varied widely in the contribution of maize to their diets. There may have been a distinction between immigrant groups from the south that had a heavily agricultural subsistence base and local hunter-gatherers who were gradually incorporating some farming into their lifestyles. This slow and incomplete adoption of agriculture is in contrast to the situation in other parts of the world where agriculture, once introduced, spread rapidly and quickly replaced hunting and gathering. It’s still not clear why, although Wilshusen and Perry note that as a tropical plant originating in Mexico, maize would have been poorly suited for the harsher climate of more northern latitudes, and that it would have taken some time for people to breed hardier varieties. It is also apparent that the variety of maize initially introduced was small and not as obviously superior to local wild plant foods as later varieties, and that it was initially introduced without an accompanying “package” of other domesticated foods, as was the case with agricultural spreads in other areas. Domesticated squash seems to have been introduced not long after maize, but separately, and domesticated turkeys appear to have been introduced from a different direction altogether, although the timing and details of their domestication remain very murky. Be that as it may, the main point Wilshusen and Perry make in regard to this slow adoption of maize is that it is likely that women, who based on cross-cultural studies of hunter-gatherers tend to be responsible for gathering of plant foods, were involved in the initial use of maize in the northern Southwest. However, this small-scale introduction of a new food, even one associated with a new type of food production, probably wouldn’t have had a major impact on existing gender roles or division of labor. That would come later. The full “Neolithic package” appears to have arrived in the northern Southwest between AD 300 and 600, with components including a larger, more productive variety of maize known as Harinosa de Ocho; beans, newly introduced from the south; greater use of turkeys for both meat and feathers; and greater investment in facilities for food storage and processing. The greater productivity enabled by these innovations led to rapid population growth and the spread of agricultural groups over the landscape, in striking contrast to the lack of such growth with the initial introduction of maize much earlier. Wilshusen and Perry associate these developments with the transition from Basketmaker II to Basketmaker III, as well as with the major changes in the roles of women that they document. Additional support for these changes in food production come from complementary changes in storage facilities and grinding tools. As documented in the well-studied Dolores area, the importance of storage seems to have risen over the course of the late Basketmaker III and Pueblo I periods from AD 650 to 875. Storage facilities changed from small pit rooms isolated from the main dwellings to more secure and more solidly built storage rooms directly attached to living rooms and only accessible from them. These typically consisted of two storage rooms at the back of each living room, the beginning of the “suite” layout that would continue to be a key architectural feature into Chacoan times. It is possible that at least initially these paired rooms were used to store two years’ harvests, one in each room, so as to provide a subsistence buffer against drought and other unexpected problems. There was also a shift over this period in grinding implements from basin metates with one-handed manos to much more efficient trough metates with two-handed manos. Beyond this shift, a greater variety of grinding tools became common over time. Together with the storage data, this indicates an increased importance of grinding as a component of food preparation. In the modern Pueblos grinding is a female-associated activity, part of an overall suite of food-preparation tasks accomplished by women that also includes shucking, shelling, drying, and storing corn. Of these tasks, however, grinding is considered particularly important to the female role, and it is an important part of female puberty ceremonies (of which the Navajo Kinaaldá, of clear Pueblo origin, is probably the best known). Men, on the other hand, are responsible for planting and harvesting the corn, as well as protecting the fields. This seems to be a change from the presumed hunter-gatherer system in which women were generally responsible for gathering plant foods as well as processing them, and Wilshusen and Perry suggest that it may have arisen in early Pueblo times as fields at greater distances from residence locations in villages became increasingly vulnerable to attack by enemies, prompting men’s role as warriors to encompass guarding fields and, in time, tending them as well. Keeping a household supplied with all these pots would have been a major part of a woman’s domestic labor, in addition to the food processing tasks mentioned above, along with other major responsibilities such as caring for children. And speaking of children, Wilshusen and Perry go on to discuss human reproduction and the apparent changes in it associated with the other changes they identify. The two main changes they note are shifts in the use of cradleboards and an apparent increase in the societal fertility rate. This part is somewhat less thorough than the food production part of the paper, but it does still identify some intriguing evidence for change. Foot rests on cradleboards disappear. According to Wilshusen and Perry, these changes together indicate that women had less need to move while carrying children in cradleboards, but that they needed more cradleboards overall, possibly indicating that they had more children. This part of the paper does not go into much detail about where these conclusions come from, but the overall conclusions is that this is further evidence that women were more tied to the domestic sphere in Pueblo I, and possibly that they had more children. On that note, demographic data appear to indicate that the population increases seen in at least some part of the Pueblo world during Pueblo I were due largely to natural increase after initial immigration into new areas. The best data come from the Central Mesa Verde and Eastern Mesa Verde areas, both of which seem to show this pattern. Prehistoric demographics are notoriously hard to reconstruct, but based on the large recent data sets from major excavation projects Wilshusen and Perry propose that a Neolithic Demographic Transition (a major increase in fertility associated with the beginning of intensive agriculture) began in the northern Southwest around AD 300, with major consequences over time for women in particular, given their gender-defined economic roles. This is comparable to evidence seen in other parts of the world with the beginning of agriculture. The key point here for the role of women is that with increasing rates of both childbirth and survival of children beyond infancy, families would have become larger, increasing the amount of domestic labor required of women to maintain their households given the gendered division of labor presumed to have developed. This would be one explanation for the increased importance of food processing mentioned above. 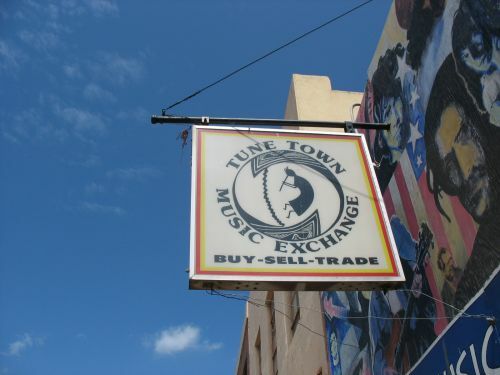 Finally, Wilshusen and Perry talk about exchange and social power. The discussion here is very abbreviated, and relies heavily on references to the next chapter in the book (which is a little odd), but the basic idea is that rock art evidence shows a shift in social power to male leadership of ritual in late Basketmaker III, continuing into Pueblo I. Female economic roles expressed in matrilocal residence may have driven men to make external trade alliances, which over time developed into new ritual systems focused on important lineages within villages rather than large public rituals at central places not necessarily associated with a specific lineage or community. Matrilineal lineages were still important, and the focus of key rituals, but changing gender roles may have involved an increased role for the men of the lineage in certain types of rituals. Burial evidence from Ridges Basin may support some of these ideas, with striking differences in male and female burials, particularly in the types of exotic goods included. Both women and men were buried with exotic items occasionally, but the specific types of items varied, suggesting gendered access to different trade systems. There are also geographic differences within the basin suggesting different community connections and ideological systems. This section is intriguing but very sketchy, even compared to the rest of the paper. More detailed discussion of some of these ideas will have to wait for the next chapter. Overall, the conclusion of this chapter is that over the course of the early Pueblo period gender roles shifted in a way that evolved into the system(s) that are well known from the modern Pueblos. This may have been a response, in part to the demographic shift resulting from the development of intensive agriculture, with its resulting higher birthrates and changes to the roles of women. Women’s labor was key to this transition, but it’s not clear that it was actually good for women as a class on net. There has been some discussion of the idea of “parallel status hierarchies,” in which men and women had different tasks but both allowed meaningful status through high achievement. However, later evidence from Pueblo sites shows that women were often excluded from access to high-value resources such as meat, and that their graves were generally less elaborate than men’s (a contrast to the Pueblo I situation in at least some areas). It doesn’t appear that many strictly comparable studies of these issues have been done of the Pueblo I period itself, so it’s hard to say how these changes felt for the women who were living through them. The authors of this paper seem to lean toward thinking the changes were not actually beneficial for those women, but the evidence is thin enough that it’s not clear. Above I have summarized the arguments of this chapter as best I could, but it’s worth noting that the argumentation of the chapter itself is highly abbreviated, and summarizing it has required a lot of assumptions and interpretive leaps. It kind of reads like this paper is an abbreviated version of a longer argument, with some important parts left out. Nevertheless, it raises a lot of interesting questions that have rarely been addressed in Southwestern archaeology, especially regarding the early Pueblo period, and for that alone it is valuable. 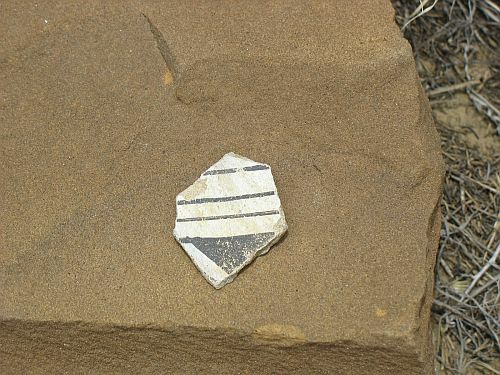 The initial discovery of chemical markers for chocolate on potsherds from Chaco Canyon in 2009 was a hugely significant development in understanding Chaco. The evidence for the presence of chocolate, a Mesoamerican product that couldn’t possibly have been locally grown and is very unlikely to have been gradually traded northward through a series of intermediaries, gave a huge boost to the “Mexicanist” school of thought about Chaco, which holds that many of the unusual aspects of the Chaco system are due to influence from Mesoamerica. The initial study only involved a few sherds, though, and understanding the exact role of chocolate at Chaco and its implications for Mexican contact needs a much deeper understanding of where and when cacao was present in the ancient Southwest. Thus, soon after the initial discovery further research by a different set of researchers (using somewhat different methods) began to test other pots from Chaco and elsewhere. They did find further evidence that at least some of the famous cylinder jars from Chaco were used in the consumption of chocolate, but they also found traces of cacao in vessels of similar form from the later Classic Hohokam period in southern Arizona, and, most surprisingly, also in vessels from the “small-house sites” at Chaco and elsewhere that are thought to have housed the lower classes of Chacoan society. The previous evidence for chocolate came from distinctive vessels at the “great houses” that are the hallmark of the Chaco system and seem to have been used by elites (though exactly what they used them for remains unclear and controversial). This is exactly the kind of setting where it would be unsurprising to find unusual, exotic things, and indeed the great houses clearly contained many such things in addition to the chocolate. Finding this sort of exotic foodstuff in more mundane pots at the small houses implies that it may have been more widely accessible than previously thought, which has important implications for understanding the nature of the Chaco system. Well, now things have become even more complicated. 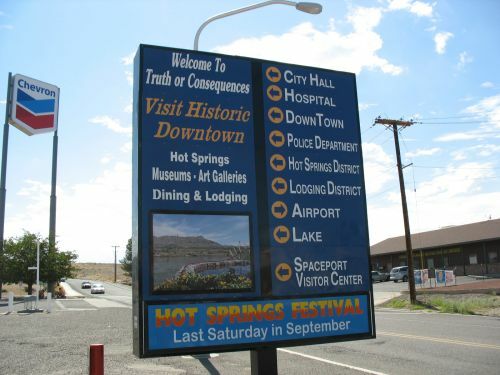 The same researchers who did that follow-up study have done another, this time looking at a much earlier period and a different part of the Southwest. 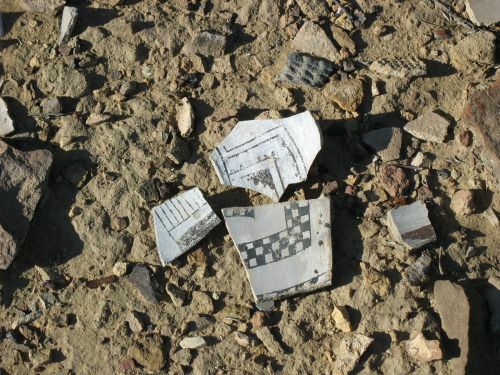 They used their same techniques to test for the presence of chocolate in pottery at Alkali Ridge Site 13 in southeastern Utah, a very important early village site dating to the eighth century AD. Site 13 was one of the earliest large villages established in the northern Southwest during the Pueblo I period, and its architecture shows some striking parallels to later Pueblo I villages such as McPhee Village in the Dolores, Colorado area, as well as to some of the early great houses at Chaco and elsewhere that developed even later. The early Pueblo I period in southern Utah is also associated with the introduction of a new type of pottery, San Juan Red Ware, which was widely traded from an apparently rather restricted production area and probably used for ceremonial purposes of some sort. In addition to being a different color from the more common gray and white pottery of the area, San Juan Red Ware also featured a distinctive design system in its decoration, one without obvious local antecedents. Combined with the distinctive architecture, this has led some archaeologists to posit that there was a migration into southern Utah during early Pueblo I from somewhere to the south, bringing these distinctive traits. In that context, looking for cacao makes sense, as that would be a clear sign of ties to the south and cultural distinctiveness. Dorothy Washburn, who was the lead author on both this and the previous study, has actually written mainly on design style in ceramics and other handicrafts, focusing on symmetry patterns. Based on the changes she has found in these patterns, she has argued for a very strong Mexicanist interpretation of Chaco, involving actual migration of people from far to the south bringing a distinctive pottery decoration style. She seems to have a similar view about Alkali Ridge, for similar reasons. In any case, the study found that there was in fact evidence for cacao on several of the vessels found at Site 13, including some (but not all) of the redware ones. The conclusions, understandably, focus on the association between the new ceramic design system and the use of chocolate, but in fact the redware vessels don’t seem to be much more likely to have evidence of chocolate use than the other ones that were tested. It’s quite possible that San Juan Red Ware was associated with consumption of chocolate specifically, but it seems that other types of pottery were also used for chocolate-related purposes. This is all very interesting, but it’s also confusing and hard to interpret, in a way that the authors of this paper don’t really address. Back when it seemed like chocolate was limited to cylinder vessels at Chaco great houses, that was easy to interpret: chocolate, like many other exotic goods found at these sites, was part of an extensive trading systems for elite goods, probably used for ritual purposes, which the elites of Chaco participated in (and perhaps dominated and directed). Finding it in the Hohokam vessels implied a similar system operating among elites at Classic Hohokam sites, which is consistent with some interpretations of Classic Hohokam society, plus the Hohokam in general show lots of evidence of contact with Mesoamerica in general so the presence of chocolate is much less surprising there than it was at Chaco. Finding it in the small houses at Chaco complicated the story somewhat and implied that the chocolate imported to Chaco wasn’t as restricted as had been thought, but since it was already known to be present at the great houses it’s not too surprising that the contemporaneous small houses had it too. Alkali Ridge, though, is much earlier and much further north than any of these other sites. Getting chocolate there in significant quantities would have required a pretty elaborate and robust supply chain over a very long distance, much of which was inhabited by societies that are not generally considered to have been capable of this kind of long-distance coordination. Checking some of those intermediate areas (especially the Hohokam region) to see if they too had chocolate this early is necessary to understand the logistics of this. There’s also the question of time. 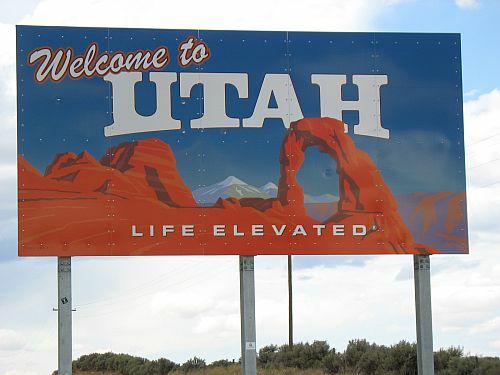 We now have evidence of chocolate from Utah in the eighth century, New Mexico (and to a lesser extent Colorado and Arizona) in the eleventh, and Arizona in the fourteenth. There are some big gaps there that need to be filled in to determine if these are three snapshots of a long-term and continuous tradition of chocolate consumption in the Southwest (which would have important implications about trade networks and relations with Mexico) or three separate episodes of chocolate being introduced from the south, possibly through population movement (which would have important implications for regional culture history in general). I think the most important place to look for evidence of continuity between Alkali Ridge and Chaco is in the large late Pueblo I villages in southwestern Colorado, especially the Dolores-area ones like McPhee Village. These sites have apparent connections to both earlier villages like Site 13 and later developments at Chaco. If they also reveal evidence for chocolate use, that would be a strong indication of continuity. The most important places to check for continuity between Chaco and the Classic Hohokam would probably be the Pueblo III communities in east-central Arizona, which again show connections in both directions. Both of these sets of sites are among the best-studied in the Southwest and there should be plenty of pots available for these analyses. Finally, there is a methodological issue here. It’s possible that these tests aren’t actually detecting chocolate at all, but something else. The authors of the recent paper noted this possibility and looked into whether there are any plants native to the Southwest that might have chemical profiles similar to cacao that would throw off the analysis. They didn’t find any, but they note that many plants have not been analyzed in this way and it’s possible there is a different plant that is showing up in these analyses instead. Another possibility is that there is something about their method itself that is leading to false positives. It’s noteworthy that they have been finding much more extensive evidence of chocolate than the team, led by Patricia Crown and Jeffrey Hurst, that did the initial Chaco study found. That team hasn’t published any more about chocolate at Chaco since then, but I hear Crown was able to do some re-excavation in Room 28 at Pueblo Bonito this summer so there may be more from her on this in the future. Ideally I’d like to see a test of both methods on the same vessels to see how they match up. The ultimate message here is that even important discoveries, like chocolate at Chaco, require many further studies and refinements to interpret properly. We’re nowhere near a full understanding of the true role of chocolate at Chaco or any other site in the prehistoric Southwest, but every study gets us closer. I have been doing research in just this area by collecting clays and firing them in open mesquite fires. While it is easier to keep carbon based paint on a pot in a reducing atmosphere this doesn’t account for polychromes. To make polychrome with a carbon based paint, like the ubiquitous Gila Polychrome, requires an oxidizing atmosphere. Certain kinds of clays have the ability to hold these carbon paints through a firing, bentonite clay in particular. Modern pueblo potters have used a slip called Cochiti slip which has these properties, ancient potters in cultures such as the Salado had access to similar slips. The most striking fact brought out by these tests is the effect of the type of clay on the permanence of the carbon. Bentonitic and other highly adsorptive clays retained a good black under firing conditions that completely oxidized the carbon on unnadsorptive, sedimentary clays. All of the clays that held the paint well required a high percentage of wafer to bring them to the plastic state and they had high shrinkage. These clays take up much more of the paint solution than the less adsorptive clays, and on drying, the clay plates are drawn tightly together, protecting the film of paint that surrounds them. The effectiveness of hydrofluoric acid in facilitating oxidation of carbon paints is explained by the fact that it attacks the clay, opening the surface and loosening the bond and thus exposing the carbon to air. The relation of the type of clay to the depth of color of carbon paint from a plant extract is not a matter of merely theoretic interest to the technologist. It has a bearing on the distribution of this class of paint because it could not be produced in regions lacking adsorptive clays unless such clays could be obtained in trade. The use of plant extracts is not open to free choice or established merely by custom; it is limited by ceramic resources. This is particularly interesting given the well-documented expansion of carbon-based pigments at the expense of mineral ones over the course of the late prehistoric period. If special clays were required to make this work, and those clays had restricted distributions, what accounts for the change? In areas that switched from mineral to carbon paint, such as Chaco, was this the result of a change in clay sources? The discovery, perhaps due to increased contact with other areas that had long used carbon, of which local clay sources worked for this? Importation of clay? Importation of finished pots? This raises a lot of questions, which to my knowledge have not received much attention in the archaeology of these areas, despite the fact that it’s now been several decades since Shepard’s research. “Never read the comments” is generally sage advice, so it’s likely that many of my readers have missed the interesting comment thread in response to my previous post. I won’t try to summarize it all here, but the gist is that a potter showed up and took issue with my use of the word “paint” to describe the pigments applied to prehistoric Pueblo pottery. Apparently, while archaeologists routinely refer to these pigments as paints, that’s not actually an accurate characterization and they are instead best described as types of “slip,” a term that archaeologists usually use only for the underlying layer of thin clay that the “paints” are often applied to. There’s a long history of archaeologists appropriating and misusing terminology from other fields, so it’s not surprising that they would have done this in this case too, but I’m not sure how best to proceed with the terminology, as it is pretty useful in practice to be able to distinguish the underlying “slip” from the “painted” designs on top of it. For now I’ll try using the (hopefully) more neutral term “pigment” for the “paint” and continue to use “slip” for the underlying clay. Another issue that came up in the discussion, however, is separate from the terminology. This is the question of how the carbon-based pigments that are so well known from many parts of the Southwest could have adhered to pots after firing at all. After all, at the temperatures necessary to create usable ceramics any purely carbon pigment would burn right off. As I started to think about it, I realized that this was indeed a puzzle, and I went looking back into the literature to see if it had been addressed anywhere. The chemical tests Hawley suggests to distinguish among these types of pigment are complicated and involve the use of dangerous acids, so they have not caught on as routine methods for archaeological analysis in more recent years. The tests appear to have been worked out and conducted mainly by Hawley’s father Fred Hawley, who was a chemist at a smelter in one of the mining areas of Arizona. Instead of these tests, archaeologists have generally tried to learn to distinguish the more common types by sight. As one of the papers I discussed earlier found in a test of this method, it works pretty well except in more marginal cases that are difficult to interpret using the standard visual criteria. The methods that have been proposed more recently using modern imaging technology have also not yet become very popular. In general the visual criteria seem to work fine. As I noted in the previous post, the fact that both organic and mineral pigments seem to work to create black designs, but the mineral type is basically the same as the carbon one, raises the question of why there were two types at all. I suggested that cultural tradition rather than technological considerations probably was the main factor. Hawley doesn’t address the question in those terms, but she does argue that the different pigment types correspond to different cultural traditions, and the second half of the paper consists of her conclusions about cultural provinces and their spheres of influence based on pigment types through time. Her basic scheme of carbon pigments predominating in western areas and mineral pigments further east has generally held up, but otherwise her interpretations show how little was known at the time about Southwestern prehistory. She was clearly writing before tree-ring dating had established a firm foundation for the absolute chronology of cultural developments and pottery types, and the assumptions she makes about which sites were contemporary are strikingly wrong in light of that chronology. This makes her conclusions about changing patterns of cultural influence through time basically useless. All that said, what about the question I mentioned earlier? How does the carbon pigment survive firing? Hawley’s answer, backed up by the chemical tests, was that it actually contains some mineral inclusions in addition to the carbon, especially silica and carbonates that melt in the process of firing and form a very thin film over the carbon that protects it from burning away. She considers this layer too thin to be considered a glaze, but it appears to serve the same basic function. It only works, however, when firing is in a reducing atmosphere, i.e., with oxygen prevented from reaching the surface of the pot. It’s not totally clear from her explanation where these mineral compounds come from, but the implication seems to be that some are from the plants from which the pigment is made and others are perhaps from the clay of the underlying pot. In the case of the mineral pigments, these potential sources are complemented by the trace silica in the iron oxide. As the more recent papers note, this interpretation has been questioned by others, most significantly Anna Shepard (another pioneering ceramic analyst at the same time as Hawley). It seems clear, however, that getting these pigments to survive firing requires some sort of chemical reaction along these lines, involving compounds in the pigment and/or the clay, along with a reducing atmosphere during the firing process itself. It turns out pottery is pretty complicated! Archaeologists usually use pottery types primarily as a means to date sites and establish trade relationships, but studying potsherds intently with an eye to technological issues can reveal a lot of additional and potentially useful information. When I was working at Chaco, people would ask me a lot of questions. I usually knew the answers, but when I didn’t I was quite upfront about saying so. I would often try to find out the answers to questions that had stumped me, but I didn’t always succeed, and many of those questions are the ones that I remember best, even now. One of those questions had to do with the black-on-white pottery that is a hallmark of Chaco. A guy once asked me what they had used as a fixative to get the paint to adhere to the pottery, and I didn’t know. I didn’t really make much of an effort to find out then, as I didn’t really have any idea where to look. Recently, though, I’ve read two papers that shed interesting light on this question. Understanding them, though, requires some background on Pueblo pottery in general. Basically, there are three main types of paint that were used in the prehistoric Pueblo Southwest. Two of these were in use during the period when Chaco was occupied: mineral and carbon. (The third, lead glaze, wasn’t used until later.) Both were used to produce a black color. Other colors were occasionally produced by a variety of means, but for this period black was the overwhelmingly dominant color of painted ceramics. It’s generally possible for experienced archaeologists to tell mineral and carbon paint apart by sight. Although they both tend to look black on a well-fired pot, there are various subtle differences between the two. Both of the papers I mentioned above are about using more formal means than visual criteria to tell mineral and carbon paint apart. One, by Joe Stewart and Karen Adams, used a scanning electron microscope-energy dispersive X-ray spectrometer (SEM-EDS) system to differentiate the two based on the amount of iron detected in the pigment. The other, by Robert Speakman and Hector Neff, used laser ablaction-inductively coupled plasma-mass spectrometry (LA-ICP-MS), a simpler and potentially less expensive method to distinguish between the two types of paint based on the concentrations of various elements. Both found that the methods they used came up with similar results to traditional visual methods, and were superior for certain sherds with unusual mixes of characteristics that made them visually ambiguous. Speakman and Neff also found a surprising amount of variety in elemental composition even within the “carbon” and “mineral” groups, suggesting that there were multiple “recipes” used to mix paint in prehistory, not just the two broad categories. This isn’t all that surprising given that this is clearly the case in modern times based on ethnographic data, but it’s still interesting. That’s all well and good, but one thing that occurred to me in reading these papers was that it’s not at all clear why there would be multiple paint recipes, since they all ended up with pretty much the same result and some were definitely more complicated than others. This is particularly the case when considering mineral paint, since in many cases it appears that it was actually mixed with the plant concoctions that were in other places used independently as carbon paint. If boiling down beeweed produced a perfectly suitable black paint, why bother adding hematite? This might well explain why the trend over time was from mineral to carbon paint, but it’s still unclear why mineral paint originated in the first place. 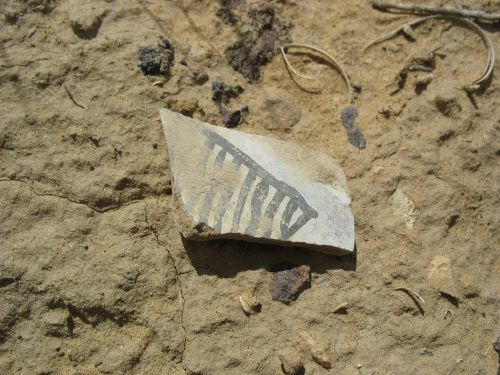 It does not appear to have predated carbon paint overall, at least at Chaco, where both carbon and mineral types are present as early as Basketmaker III. The lack of obvious functional reasons for preferring mineral to carbon paint suggests that the choice may have been more a matter of cultural tradition, which is interesting and implies that some sort of cultural differentiation may have been present quite early in the prehistory of the northern Southwest. This isn’t really surprising, as there is plenty of other evidence for this, but teasing out the implications of all these different lines of evidence pointing to differentiation in material culture is a task that archaeologists have only recently begun to take on. It should be interesting to see what more we have to learn from these differences. Where Did the Cahokians Come From? 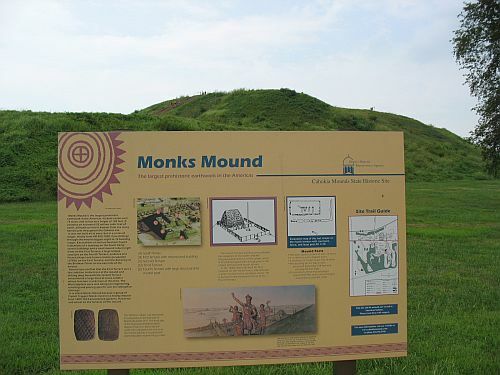 Regardless of exactly how many people lived at Cahokia, it’s clear from recent research that the population of the site and its immediately surrounding area grew immensely in a short period of time in the eleventh century AD. As Timothy Pauketat points out in the 2003 article that I was discussing earlier, the scale of this growth is much too great to be due to natural increase of a local population. Thus, even though there was a local population of some size in the American Bottom in the immediately preceding period that presumably contributed to the growth of the Cahokia site, it’s pretty clear that there must have been quite a bit of immigration in addition to account for the huge influx of people. Who were these people, and where did they come from? It can be fiendishly difficult to untangle migrations in the archaeological record, even in conditions like this where it seems clear that there must have been some migrating going on. 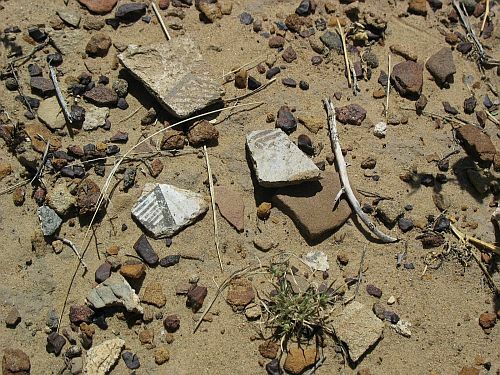 Archaeology depends mainly on the remains of material culture, which can change quite rapidly under conditions of change and stress such as those that often obtain during and immediately after migrations. Nevertheless, there do seem to be some clues to where at least some of the immigrants into the American Bottom may have originated. These clues mostly revolve around the type of material culture on which archaeologists most often rely to understand prehistoric societies: pottery. Pots can’t automatically be equated with people, of course, but certain types of pottery are sufficiently distinctive and limited in distribution that they may serve as markers for population movements. In the case of Cahokia, Pauketat and others have pointed out that one of the many pottery types found in deposits dating to the period of population growth bears a striking resemblance to a type known as “Varney Red Filmed” found in northeast Arkansas and southeast Missouri around the same time. Importantly, these pots are often tempered with ground shell. Shell-tempering would later become one of the defining traits of Mississippian societies throughout the South and Midwest, but it appears particularly early in the area where Varney Red Filmed was made, starting around AD 800. According to another study reporting on evidence of Varney-like ceramics found at sites in Wisconsin, examples of Varney wares have been found in the American Bottom starting shortly before AD 1000. While these early finds are considered trade wares, by the time Cahokia emerges about 50 years later similar ceramics are apparently being made there, as shown by analysis of the clays in them, and some shell-tempered sherds that seem to be made from American Bottom clays were identified at the aforementioned Wisconsin sites, attributed to a short-lived influx of immigrants from the American Bottom, perhaps those who lost out in the struggles that led to the rise of Cahokia. Returning to Pauketat’s 2003 article, he finds that not only are locally produced but clearly Varney-influenced pots being made at Cahokia itself in the mid-eleventh century, some of the sites in the rural Richland Complex to the east, which was settled rapidly around the same time, show the same high proportions of Varney sherds as some areas of Cahokia itself, implying that at least some of the people who established the Richland Complex came from the American Bottom. 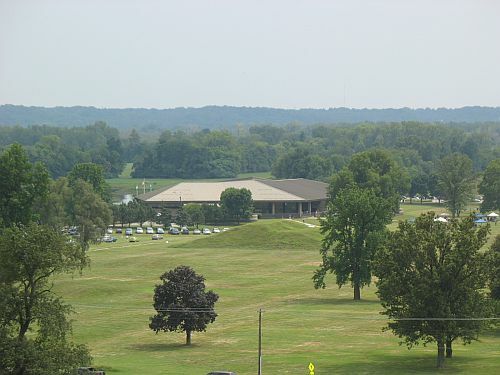 The relationship between these people and those at Cahokia remains difficult to entangle. One of the hallmarks of the American Bottom in the period immediately preceding the rise of Cahokia is remarkable diversity in ceramic style. Varney is only one of the many local and “foreign” ceramic styles present in sites during this period, and it seems clear that people were coming to the area from all over. Nevertheless, the important similarities between Varney ceramics and those that soon begin to spread along with other attributes of Mississippian culture implies that northeast Arkansas and southeast Missouri may have played an important role in developing the complex of ideas that we today call “Mississippian” and that an increasing body of research suggests initially spread through the influence of Cahokia. Studying the archaeology of these areas during the period before and during the rise of Cahokia is therefore potentially important. Ceramic sourcing using Instrumental Neutron Activation Analysis has been one line of evidence applied to sites in southeast Missouri during this period, not least because the University of Missouri happens to have a research reactor that has been widely used for sourcing of ceramics and other archaeological artifacts. One paper from this effort, published in 2000, showed that this technique can indeed distinguish among sherds made from clays from three major physiographic regions of southeastern Missouri: the Ozark Highlands and the Western and Eastern Lowlands in the Mississippi Valley. The results showed in addition that there was extensive movement of vessels, including shell-tempered Varney wares, between the Western Lowlands and the Ozark Highlands. It can’t be determined from this data if this reflects trade or migration, but it certainly shows interaction between the two. 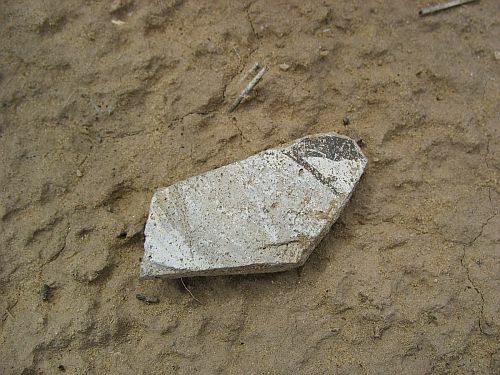 There is also some limited evidence, in the form of possibly transitional sherds tempered with a mix of shell and sand or limestone, that the shell-tempering technique may have developed here rather than being imported from elsewhere. Given the importance of shell tempering later on, the idea that it may have been an indigenous development among Varney potters may have important implications for lines of cultural influence. This is all very suggestive of the idea that some of the people who immigrated to the American Bottom around AD 1050 came from the Varney area and brought with them some ideas that they had developed there or perhaps borrowed from other groups. People were certainly coming from other directions too, and their ideas may have been just as influential even if they were less visible archaeologically. In addition, there was a longstanding local population in the American Bottom that surely played a role as well. All of these people likely contributed to the unique flowering of the greatest cultural and political center north of Mexico that began soon afterward. Untangling exactly what contributions each group made, and figuring out in more detail who they were, are bigger challenges than simply tracing where they may have come from and what their pots looked like, of course. Inspired by my recent visit to the Gila Cliff Dwellings, I’ve been reading about the Mimbres Mogollon culture of southwestern New Mexico. As I noted earlier, the cliff dwellings themselves aren’t actually Mimbres, instead belonging to the Tularosa Mogollon culture more common to the north, and they postdate the “Classic” Mimbres period (ca. AD 1000 to 1150, exactly contemporary with the florescence of Chaco further north) by over a century. 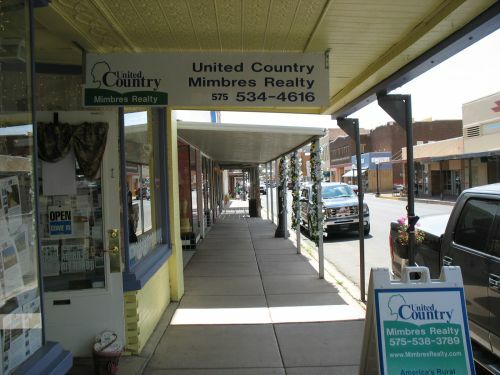 They do, however, fall well within the area occupied by the Classic Mimbres, and there is in fact a Mimbres village, the TJ Ruin, within the monument boundaries. The upper Gila River valley was a major area of Mimbres settlement during the Classic period, and it had some of the largest Classic villages, although it is not nearly as well understood as the Rio Mimbres valley which is often considered the Mimbres “heartland” and which gave the culture its name. A review article by Michelle Hegmon from 2002 provides a good and relatively recent overview of the major issues in Mimbres archaeology. The Mimbres are best known for their pottery, some of which features elaborately painted naturalistic designs unlike anything else known from the prehistoric Southwest. This pottery was painted with black paint on a white slip, as was Anasazi pottery from Chaco and other areas at the time, and many of the abstract geometrical designs that form the bulk of the decorated pottery are reminiscent of Anasazi styles. There’s no equivalent among the Anasazi to the naturalistic designs, however, which show elaborately detailed people, animals, possible mythical scenes, and much else. No two designs are exactly alike. Most of the figurative designs were on bowls which were placed with burials, usually with a “kill-hole” through the center of the vessel, which was then placed over the face of the buried individual. Iconographic study of Mimbres pottery dates back nearly a century, starting with the work of Jesse Walter Fewkes of the Smithsonian in the 1910s, but in the past 20 years it has been supplemented by studies taking a more technological approach. Particularly important has been a series of studies using instrumental neutron activation analysis (INAA) to determine the sources of the clay used in the pots and untangle patterns of production and exchange. The results of these studies have generally been consistent with widely distributed production of pottery throughout the region, which is in contrast to other documented cases of community-level specialization in pottery production known from other parts of the Southwest at various times. Design analysis has led some to suggest that the finest of the black-on-white bowls were made by a very small number of potters, however, which implies that perhaps a few specialists in villages scattered across the region made almost all of the well-known naturalistic vessels. Speaking of villages, one of the most interesting things about the Mimbres is that theirs were quite different from communities found throughout the rest of the Southwest during the Classic period. While most areas, including the Chaco region, had communities of loosely clustered small house sites, the Mimbres were aggregated into large, dense villages made up of roomblocks very similar to those that would become increasingly common in Pueblo sites to the north starting in the thirteenth century and continuing into the historic period. Indeed, some have argued that the Classic Mimbres invented the “Pueblo” as a type of community, and even that many of the social institutions of the modern Pueblos, such as the kachina cult, derive ultimately from Mimbres precursors. There is definitely a clear continuum in artistic style from Mimbres pottery through Jornada Style rock art to the Rio Grande style of rock art and mural painting that appears among the northern Pueblos beginning around AD 1300. After the decline of Chaco around AD 1130, the northern Southwest witnessed a pattern of ever-increasing aggregation eventually resulting in the modern Pueblos with their very Mimbres-like plans and institutions. There have been various explanations offered for why this occurred, and I think those that attribute it largely to increased warfare are among the most persuasive. There is definitely much more direct evidence for violence after about AD 1150 than before then. Whatever was causing trouble in Pueblo societies at this time, it seems very likely that solutions drawn from the Mimbres experience became increasingly attractive further north. But what was that experience? Why did the Mimbres aggregate into large Pueblos at a time when everyone else lived in scattered small houses? The Classic Mimbres period coincides with a time of remarkable peace throughout most of the Southwest, so defense seems less likely as an explanation here than it does later on. Some of the Mimbres pots do show scenes of violence, including a well-known beheading, but it’s not at all clear that these show actual events rather than myths. In general, there doesn’t seem to be any more evidence for warfare among the Classic Mimbres than anywhere else at the same time, which makes their much denser settlement pattern particularly mysterious. It may have had something to do with irrigation agriculture, which the Mimbres had probably adopted somewhat earlier under the influence of the Hohokam in southern Arizona, who were by far the most accomplished irrigators of the prehistoric Southwest. Among the Mimbres, as among other Mogollon groups, there was extensive Hohokam influence early on, which seems to have largely ceased by AD 1000, possibly replaced by increased influence from the Anasazi to the north (although this is controversial). 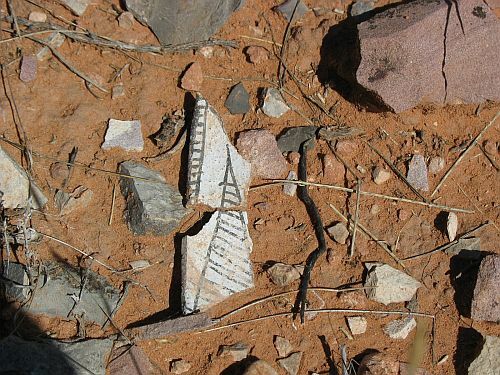 Steve Lekson, who has done a lot of work in the Mimbres area in addition to his work at Chaco, has argued that the Classic Mimbres consists of “an Anasazi lifestyle supported by Hohokam infrastructure,” and I think there may be something to that. The labor demands of irrigation may have led to residential aggregation, although it’s important to note that the Hohokam themselves never aggregated to anything like the same degree despite their much more elaborate irrigation systems. What’s even more puzzling about the Mimbres, however, is what they did after the end of the Classic period. The large villages and figurative pottery seem to come to a rather sudden end around 1150, about the same time that Chaco declined and the northern Southwest entered a long, difficult period of warfare, aggregation, and regional abandonment. It used to be thought that the Mimbres just “collapsed” at this time, with their ultimate fate unknown, but more recent research, especially in the eastern Mimbres area along the Rio Grande near the modern town of Truth or Consequences, has shown that the real story is more complicated. Margaret Nelson has been researching settlement patterns in the eastern Mimbres area, and she has found that one notable shift after the end of the Classic period involved the dissolution of the aggregated Classic villages and the dispersal of people into small hamlets, often built on the sites of Classic fieldhouses. She also sees continued production of Mimbres pottery, although apparently without the distinctive naturalistic designs, for a long time after the end of the Classic. Hegmon, who has collaborated with Nelson on much of this work, has proposed calling these occupations “Postclassic Mimbres.” They show much more extensive trade of pottery with surrounding areas than during the Classic period, as well as more variable architecture, implying that whatever social controls had held the large Classic villages together had broken down and been replaced by a more flexible social system. What’s remarkable about this is that it’s basically the opposite of what was happening everywhere else in the Southwest, where the dominant trend during this period was aggregation. The Mimbres, at least in the east, were instead dispersing. The picture is less clear in the Mimbres and Gila valleys further west, but at least some of the Classic villages seem to have continued to be occupied at lower population levels (similar to what was going on at Chaco), while a new type of occupation seen at some sites in the area, known as the Black Mountain Phase, may or may not represent a change in Mimbres culture. There is debate over whether the Black Mountain Phase actually shows continuity with Classic Mimbres or not. It’s also possible that some people headed south, to the rising center at Casas Grandes, in which case they would be participating in the trend toward aggregation. It’s becoming increasingly clear, then, that the Mimbres didn’t really collapse or totally abandon their region in 1150. Instead, they seem to have sort of splintered, with some scattering to hamlets on the sites of former field houses, others possibly reorganizing their communities into Black Mountain Phase sites, and still others migrating away from their region either south to Casas Grandes or east to the Jornada area, where the very Mimbres-like Jornada petroglyph style seems to appear around this time. This process of dispersal when everyone else was aggregating, combined with their earlier aggregation when everyone else was sprawling across the landscape, gives a distinct “out of phase” feel to Mimbres cultural dynamics. I certainly don’t have any solutions to propose to the mysteries of the Mimbres, and as far as I can tell no one else really does either. They’re among the most fascinating of the many peoples who inhabited the prehistoric Southwest, and while they are by no means the most obscure, outside of specialist circles they are known almost exclusively for their pottery. The pottery is amazing, of course, and quite deserving of attention, but there’s much more to the Mimbres than their pots.